Wipe the floor with your competition thanks to this fringed rally towel! Made from 100% cotton, this handy product features terry cloth on one side and velour on the other, and both ends are fringed. This multi-purpose item has several uses, from cleaning up household messes to polishing off golf clubs to waving at sporting events. Customize with an imprint of your brand logo to make a lasting corporate impression. Hand out this rally towel to fans in the stands or the sidelines of any athletic or sporting event! Printed with stunning full color dye sublimation, this rally towel is sure to impress anyone in attendance. It makes a great promotional product for giveaways, product launches or just for fun. Recipients can cheer on their favorite team or play a sport in style while promoting your brand at the same time. Printing is available on one side only, no exceptions. Add it to your marketing plan to see how much it can help your journey toward success! Spread the word about your brand in a new and fun way with this dye sublimated Sports Towel! 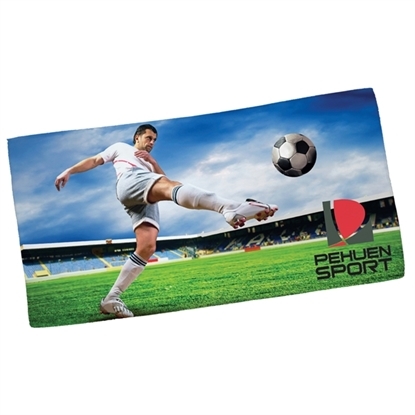 Printed with a stunning full color dye sublimation process, this sports towel is sure to impress anyone who sees it at the gym, pool, beach, outdoor location, workout area or any sporting event. Add your name, logo or advertising message to reach out to new and potential clients. Recipients can stay cool with this product when you include it in your giveaways, promotions or raffle prizes! 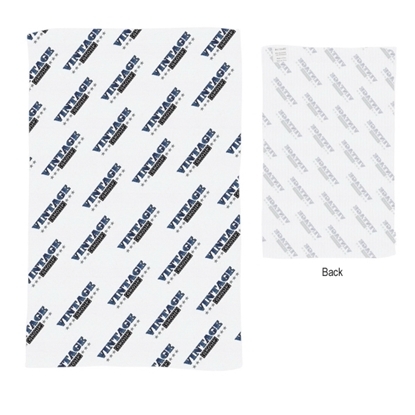 Show just how amazing your company is when you add your brand to this Cooling Towel! Printed with a stunning full color dye sublimation process, this product can be used to highlight your brand and impress new and potential clients at the gym, pool, beach, outdoor location, workout area or any sporting event. It's a great promo item for giveaways, promotions or just for company fun. They can stay cool with this dye sublimated towel while helping boost your brand! 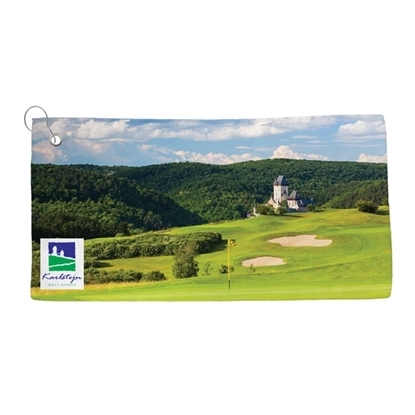 Score a hole in one for your advertising team with this dye sublimated Golf Towel! 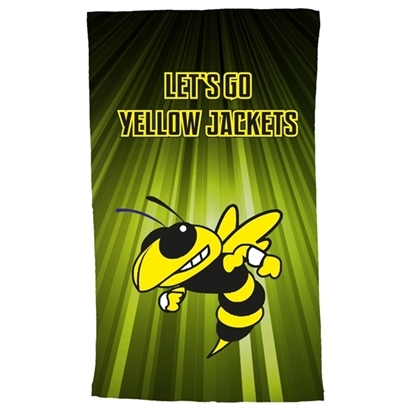 Printed with a stunning full color dye sublimation process, this cooling towel is sure to impress anyone who sees it at the gym, pool, beach, outdoor location, workout area or any sporting event. Recipients can stay cool with this great promo product when you add it to your giveaways, promotions or raffle prizes at almost any marketing opportunity! Demonstrate your support with this Stadium Rally Towel! 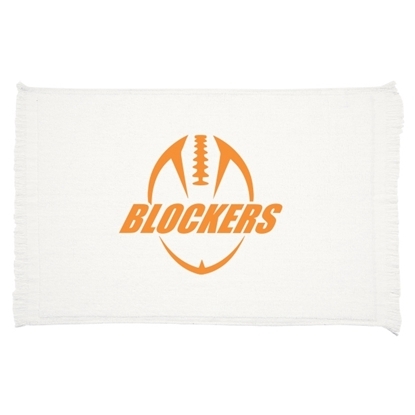 Made of microfiber material, this white towel features a customized all over print of your logo, company name, or advertising slogan for maximum brand exposure. A simple cheering accessory, this is a great giveaway at tradeshows, pep rallies, fundraising events, and much more. Clients will love to keep this towel as a souvenir of your event! Mypromotionalpens.com offers the largest and best priced selection in Promotional Sports Towels. We will price compete and we won't be under sold. Let our graphic designers make your personalized Sports Towels standout above the crowd at no charge. We won't stop until you are completely satisfied with your custom Sports Towels art proof.Use category search filters on your left to help narrow your search to find exactly what you are looking for.